Explore a range of branded sandals for men at Naaptol! Mens sandals never go out of fashion. 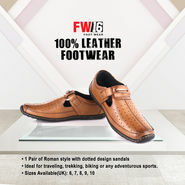 They are one of the coolest footwear perfect for both casual as well as formal occasions. Naaptol - one of the best online shopping sites brings to you a huge collection of sandals for men to help you smarten up your overall look without making any effort. These sandals come in various materials (leather and non-leather range), and vary in style, design and color. Explore the exclusive collection that boasts of sandals from various renowned brands like Woodland, GAS, Lee Cooper, Puma, Liberty, Lotto, Rockport, and more and buy the best pair for yourself today, from Naaptol.com! Make a fashion statement with right sandal! During the hot summer days, a pair of sandal does a lot of wonder to your feet. 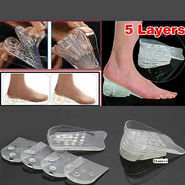 It allows your feet to breathe, making it feel fresh and full of energy. It keeps your feet cool and dry; it's super comfortable and fashionable too! Sandals come in many forms - strappy sandals, ultra-light floaters, casual flip flops, dressed up ones and so on. The styles and colors are many making sandals a hot choice for men. Sandals with ankle straps and buckles make you look elegant and trendy while sandals with open toes and trendy patterns make ideal daily wear. So, choose the style of sandal according to your need and fashion sense! Buy sandals online at Naaptol! Sandals are one of the most appreciated footwear by men. A stylish pair of the same can make many a heads turn. Available for casual, formal and ethnic wear, these sandals can be worn out for any purpose and occasion. While browsing Naaptol's collection, you will surely come across few pairs that you would love to buy. Don't waste your time searching here and there, just place the order for your most loved pair from your home and get the sandal delivered at your doorstep! Also avail added online shopping benefits like cash on delivery and reward points.